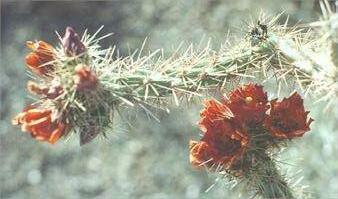 Cholla cacti typically have cylindrical stem segments, joined end-to-end in a branching, tree-like manner. Growth stops at the end of each season and is resumed by the production of new branches in the following season. 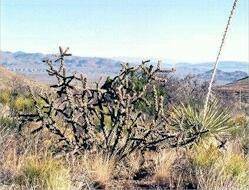 These plants are closely related to the prickly pears (also Opuntia species), which have large, flat pads. There are many cholla species in the warm deserts of North and Central America, and many more which are frost-tolerant and extend as far north as Canada and south to the mountainous regions of South America. 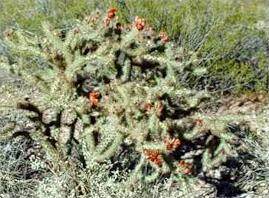 However, cholla species are often difficult to tell apart, because they can hybridise, leading to intermediate forms. In addition to this, some species hardly breed at all, because their seeds are sterile. In these cases the plants rely on clonal propagation - stem segments fall to the ground and take root, so that any local population of the plant consists of genetically identical individuals, which might differ slightly from another population of the same species. 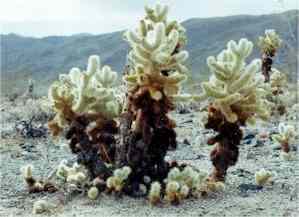 The teddy bear cholla is a classic example of this - see the right-hand image above. Here we will cover the common features of chollas, and illustrate the range of variation by focusing on a few distinctive species, including the tree cholla, teddy bear cholla, chain link cholla, chainfruit cholla, diamond cholla, buckhorn cholla and devil cholla. All these species differ in their geographical ranges or in their temperature tolerance, water requirements, soil preferences, etc. One characteristic feature of chollas is that the stem segments and branches are not truly cylindrical but have raised areas called tubercles on which the spine-bearing areoles are located. This is most conspicuous in the chain link cholla (see the image on the right below) because the pattern of the tubercles gives a chain-link effect. Also charactersistic is the fact that most chollas have brightly coloured flowers (with the typical cactus flower structure) and are pollinated by bees. In most cases, also, the fruits are fleshy and can be seen on the plants for extended periods of the year. Sometimes the fruits are brightly coloured, but in other cases they are green and photosynthetic, persisting for year after year. One example of this is the chain link cholla (see image above) but the best example is the chainfruit cholla (image further down this page), where long chains of fruits accumulate year after year unless they are dislodged. In fact, the fruits and stem segments of this plant often are dislodged by passing animals of humans - so easily that the other common name for this plant is the "jumping cholla". The fruits are usually sterile, and the plant reproduces when joints fall to the ground and take root. 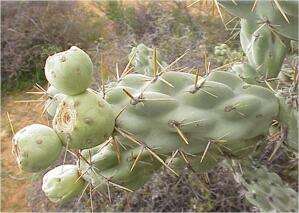 Another cholla - the clavellina - has stem segments which are easily dislodged and that are armed with very long spines. These readily catch onto the fur of animals (or human clothing) or they can spring up from the ground if an animal touches them as it walks by. The Latin name of this plant - Opuntia molesta - is aptly descriptive. It is an endemic species of the Baja California peninsular of Mexico. 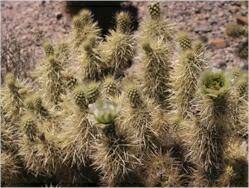 Several of the most heavily spined chollas can appear to be white in sunlight. The reason is that the spines of most chollas are covered with a papery sheath, which acts to reflect sunlight and prevent the stems from excessive heating. As would be expected, this is particularly true of the species such as teddy bear cholla and chainfruit cholla that grow in the hot, flat desert regions where the exposure to sunlight is extreme. In the right-hand image of clavellina (above) the papery sheath has been dislodged from the lowermost long spine, but not from the long spine above it. Other branching chollas also have sheathed spines, but the spines are not as dense. 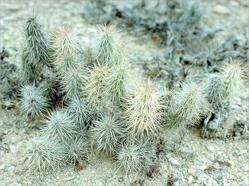 For example, the diamond cholla (image below) has relatively few, but long, spines which stick out almost at right-angles from the stem. The yellow colour of these spines is due to the colour of the sheath. A plant such as this occurs in the cooler, higher elevations and has less need to be protected from the sun's exposure. One group of chollas - the club chollas - differ markedly from the tree-like, branching chollas discussed above. These are low-growing plants which often form mats close to the ground and which branch from the base rather than from the tops of the stems. 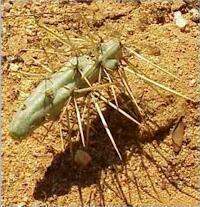 Typical of these plants is the devil cholla (Opuntia stanlyi and related species) which can grow in arid sites where the soil is saline or calcareous - a combination that few other plants can tolerate. 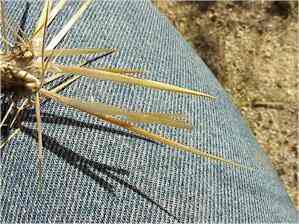 These club chollas are densely covered in spines but the spines do not have sheaths. Instead they have flattened spines, with dagger-sharp tips that can penetrate shoes or animals, feet. 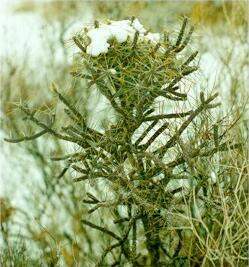 When these chollas become established in desert grasslands they present a formidable barrier to grazing animals. All chollas have a woody skeleton with a reticulate pattern (see image below), quite different from the woody ribs of the taller columnar cacti . 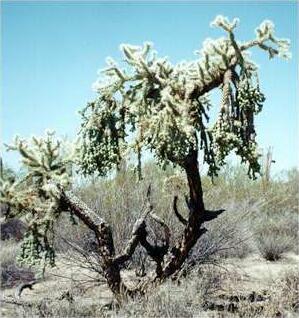 The woody skeletons of some species, such as the cane cholla, are often used to make canes or other souvenirs. 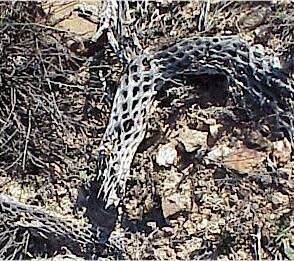 Part of the skeleton of a dead cholla stem, showing the reticulate pattern of the woody support tissues. The dense branches of living chollas frequently are used as sites for nest-building by desert birds such as the cactus wren and curve-billed thrasher. 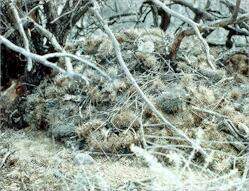 The dead remains and fallen segments of chollas also are used frequently by desert wood rats (Neotoma species) for covering and protecting the entrances to their nests. Go to Prickly pears and cholla page? Go to Cactus gallery? Go to club chollas? Go to Teddy bear cholla? Go to Diamond cholla? Go to Devil cholla? Go to Cane cholla? Go to Buckhorn cholla? Go to Chainfruit cholla? Go to Chain link cholla? Go to Tree cholla? 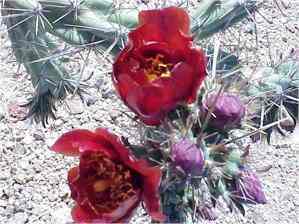 Go to Cholla flowers?